One of the best things about moving to Seattle (and the States in general) is that over here, you've got your tacos and other Mexican. In Denmark, apparently no one ever managed to import more authentic tacos. They are generally served in giant burrito tortillas or hard maize shells, only contains ground beef with store-bought spices and is served with only lettuce and big slices of tomato - and sometimes with cheese, which is not usually found up here (unless you're eating quesadillas or wet burritos - but not in tacos!). ALL WRONG. I feel so sad about all the wonderful Mexican food I've been missing out on. I've been trying to eat a lot of tacos (and burritos and quesadillas and taquitos) while I've been here. They are usually $1-$1.20 after all. Later on, I'll be posting some of my taco pictures from the last six months, but today I'll just be showing you tacos I made for lunch today. 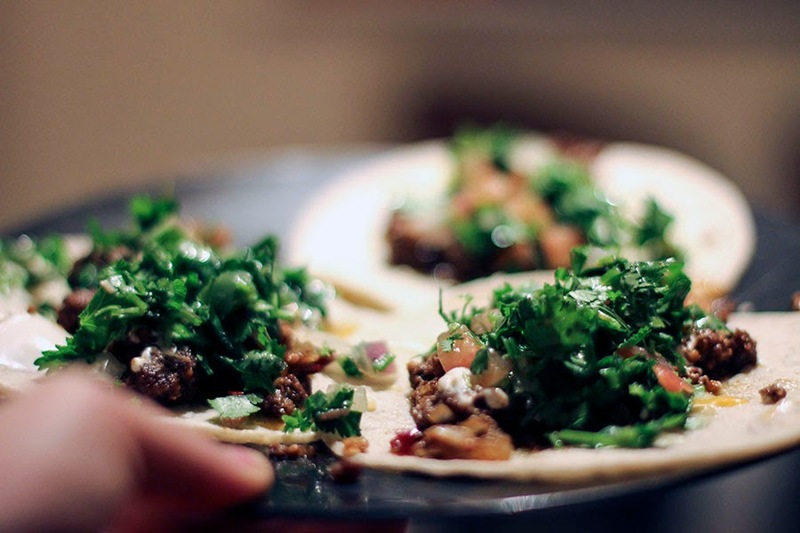 I really don't want to call them tacos and possibly offend the real taco masters, but they were good and cheap and easy to make! 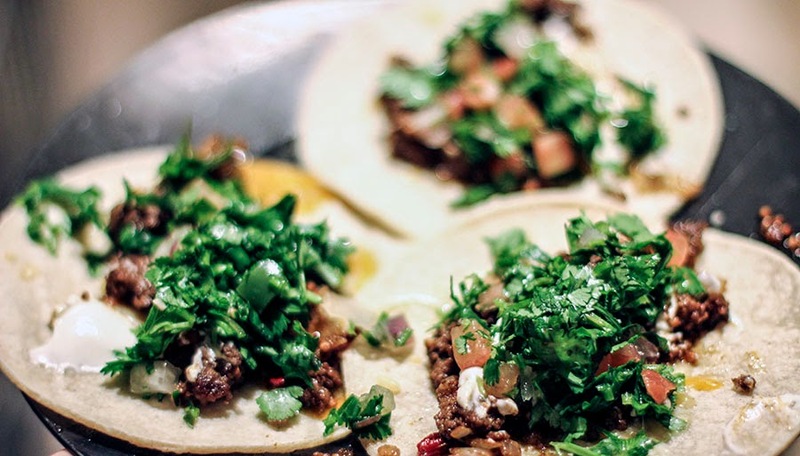 These tacos have beef fried up in a chili oil with paprika, mustard seeds, coriander and cumin.. Some salt, is added and that is about it. 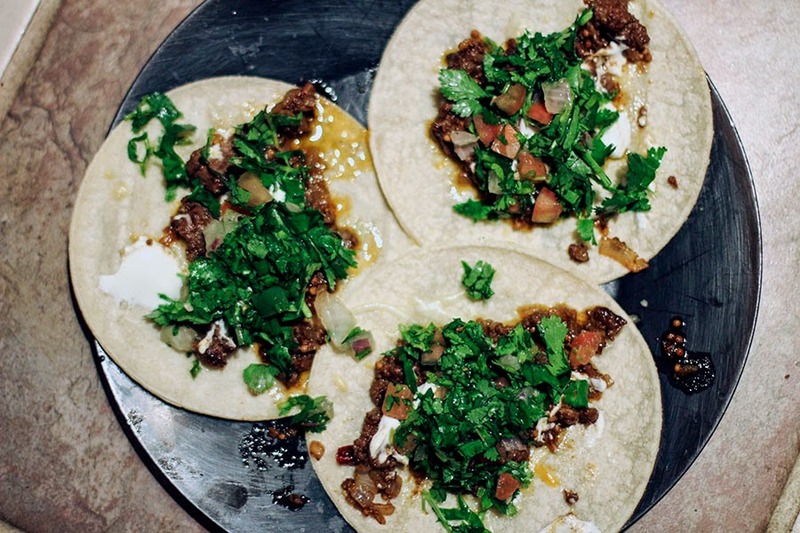 It is spicy and greasy and it is good, even though it is not a typical taco meat. I was unfortunately almost out of pico de gallo and had no more vegetables, so there is only a tiny bit on here. Chili sauce goes on and so does a mountain of cilantro. Yes, please!! A little bit of sour cream today - which normally doesn't go on there, and we are good to go! I'm not saying this is how to make it, but it is definitely a delicious upgrade from cardboard maize shells, no spices and lettuce!